Motherwell crashed to a disappointing 1-0 home Scottish Premiership defeat by Hamilton Accies on Saturday, writes Craig Goldthorp. There were three changes for Motherwell from the team which lost at Hibs the previous week as Tom Aldred, Gael Bigirimana and Allan Campbell came in for Liam Donnelly, Aaron Taylor-Sinclair and Liam Grimshaw. On a Fir Park pitch which was looking as magnificent as ever, the East Stand looked as packed as it's been for a while for this Lanarkshire derby. The first scoring chance came in the 16th minute as Chris Cadden's cross was headed powerfully goalwards by Bigirimana whose effort was well saved by Gary Woods. Conor Sammon was booked for elbowing Accies defender Ziggy Gordon before Main shot just wide on 35 minutes after a Sammon knockdown. In a first half largely short on entertainment, Bigirimana had some nice touches and was the stand out player. If Motherwell's opening 45 minutes were lacklustre then they came out for the second period showing much more urgency. Main took Campbell pass and shot wide on 48 minutes, before Bigi had a free-kick saved. 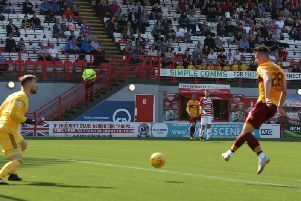 Motherwell continued to be in the ascendancy and Peter Hartley's long ball was brilliantly won by Main the air before Sammon's shot was blocked by Alex Penny. Main then failed to hit the target with two further goal efforts as the Steelmen continued to stay camped in the Accies half. Well manager Stephen Robinson made a double substitution on 62 minutes as striker Danny Johnson and winger Elliott Frear replaced Campbell and Richard Tait respectively. Despite hardly having been in the game, Hamilton sensationally went 1-0 up on 68 minutes when substitute Steven Boyd - who'd only just come on - scored with his first touch with a stunning right footed volley from 20 yards after the initial free-kick had been blocked. Aldred - back at loan for Motherwell from Bury until the end of the season - headed weakly at Woods after Bigi's long free-kick from the left flank. The visitors - backed by only 367 travelling fans - missed a glorious chance to go two up when sub Ross Cunningham blazed over from in front of goal after a Bingham cross. In the final minute Johnson shot wide from the edge of the box after Sammon's pass inside. Cunningham then missed a glorious opportunity as the game was heading into stoppage time, somehow shooting against the post when presented with an open goal at the back post after Tom Taiwo's pass across goal. Motherwell: Carson, Tait (Frear 62), McHugh, Aldred, Hartley, Cadden, Campbell (Johnson 62), Main, Rose (Gorrin), Bigirimana, Sammon.